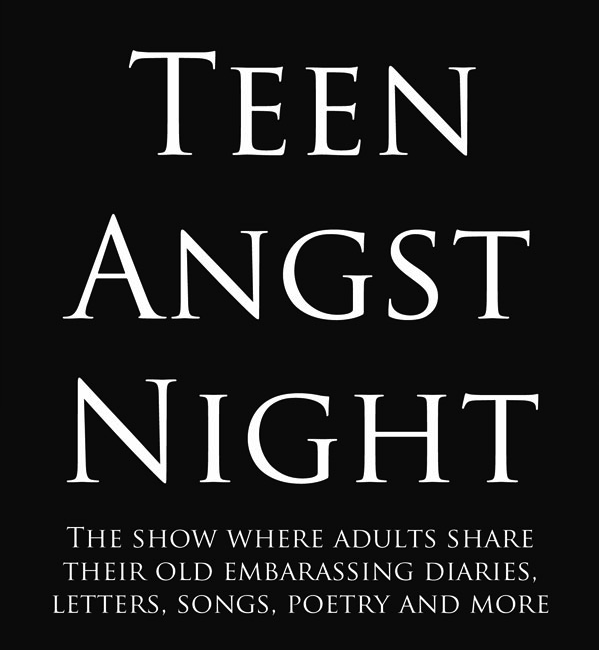 Teen Angst Night is a comedic reading series where everyday people read from their embarrassing old journals, poems, songs, essays (and more). So, get digging through your old notebooks and find some gems! 3- It’s best if the work is at least 4 years old. 4- If you cringe or feel physically upset while reading it- it’s worth sharing! The more embarrassing the better! * NOTE: Reader spots for this event are FULL. Message me to get on the mailing list to read next time. QUICK HISTORY – Teen Angst started in Calgary in 2000 with a live event series and a website, then the website was (probably) one of the first blogs-to-books and published in April 2005 with a book launch event at the KGB Bar in NYC, in 2006 the book was turned into a stage show for the High Performance Rodeo in Calgary (and sold out! ), then I created a solo show of my own horrible Teen Angst Poetry which I performed at the Toronto Fringe in 2007, Bumbershoot in 2008, the Edinburgh Free Fringe in 2011, in 2008 I was on the poetry stage at a massive festival in the UK called Latitude, and the live show happens whenever I can squeeze it into my schedule.